Although the Indiana Revised Code does not offer a statutory form for a special warranty deed, the statutes do contain language that is sufficient for a conveyance of real estate in fee simple (32-17-1-2). A special warranty deed, though it generally contains warranties of title, offers less protection for the buyer than a warranty deed. The grantor in a special warranty deed offers covenants pertaining only to the grantor's period of ownership. A grant deed that is worded according to 32-17-1-2 will contain the following covenants from the grantor and the grantor's heirs and personal representatives: (1) that the grantor is lawfully seized of the premises; (2) has good right to convey the premises; (3) guarantees the quiet possession of the premises; (4) guarantees that the premises are free from all encumbrances; and (5) will warrant and defend the title to the premises against the lawful claims of those claiming under the grantor (32-17-1-2). 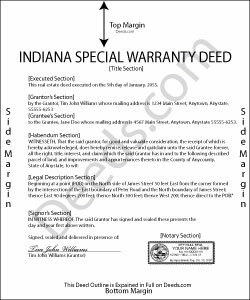 In order to submit a special warranty deed to a county recorder in Indiana, it must be dated and signed, sealed, and acknowledged by the grantor. If a special warranty deed does not contain a proper acknowledgement, it can be proved before any of the officers listed in 32-21-2-3 of the Indiana Revised Code. Acknowledgements can be taken in the county where the deed is to be recorded, or in another county in Indiana, or in another state. If the deed is acknowledged in another county or state, it must be certified by the clerk of the circuit court in the county and state where the officer resides and must also be attested by the seal of that court (32-21-2-4). Acknowledgements taken before an officer having an official seal that is attested by the officer's official seal will be sufficient without a certificate. The certificate of acknowledgment, if required, should be written on the deed or attached to it and recorded with it (32-21-2-9). Unless the certificate of acknowledgement is recorded with the deed, the deed may not be received or read in evidence (32-21-2-11). Special warranty deeds should be recorded with the county recorder in the county where the property is located. Unless a conveyance is made by deed and recorded within the time and manner provided by Indiana Statutes, the deed or other conveyance of real property is not valid and effectual against any person other than the grantor, the grantor's heirs and devisees, and those with notice of the conveyance (32-21-3-3). The priority of instruments is determined by the order in which they are filed by the county recorder.